What with my Northumberland jaunt, last weekend’s party and working in London every week, I’ve calculated that I’ve spent only ten whole days chez Duver Diary during June (and four of those working) and, whilst certain wonderful things carry on despite my neglect (roses, lavender, self seeded this and that) I do have a definite sense of the garden getting away from me. If you look closely in the photo below, for example, you’ll see convolvulus growing up rosebay willow herb, surrounded by a fringe of couch grass. So please don’t! Taking a circuit round the garden from this point takes us first to the troughs. These still have the very leggy Matthiola incana that I can’t bring myself to bin, but these have now been joined by seedlings of the (slightly shorter than ‘Purity’) white Cosmos, Cosmos ‘Sonata White’ and Salvia horminum ‘Oxford Blue.’ I’m hoping it’s going to fill out into a wall of blue and white, but it’s very early days and I do think this trough, being south facing and metal, does suffer if the weather’s warm (some chance!). And no, I didn’t line the front panel with polysterene as you’re apparently supposed to. 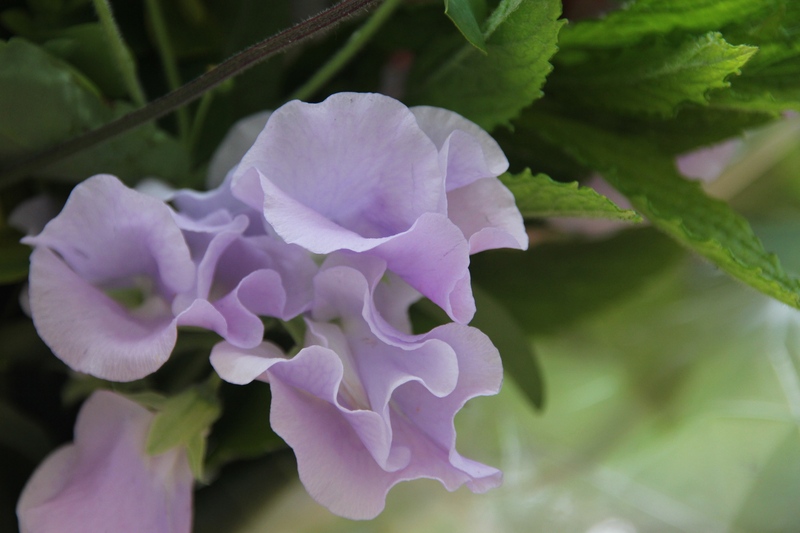 On to the veg patch and the most obvious ‘crop’ below is the Sweet Peas, definitely not edible! Otherwise, from front to back, I have (under fleece) Purple Sprouting Broccoli ‘Early Purple Sprouting’, and Cavolo nero ‘Black Magic’, and then Chard ‘Pink Flamingo’, Mange tout ‘Shiraz’, Dwarf French bean ‘Safari’ and Runner Bean ‘Lady Di’. And running along the front edge (right of photo) Courgettes ‘El Greco’ and ‘Gold Rush’. I think these are all new varieties to me except ‘Lady Di’ and ‘Goldrush’ so it will be interesting to see how they all do – and how they all taste. Meanwhile, if anyone has any bright ideas as to what veg would be happy in a very dry, south facing raised bed, please let me know, because there’s plenty of space now! In front of the main veg patch is a smaller bed holding strawberries and rhubarb. 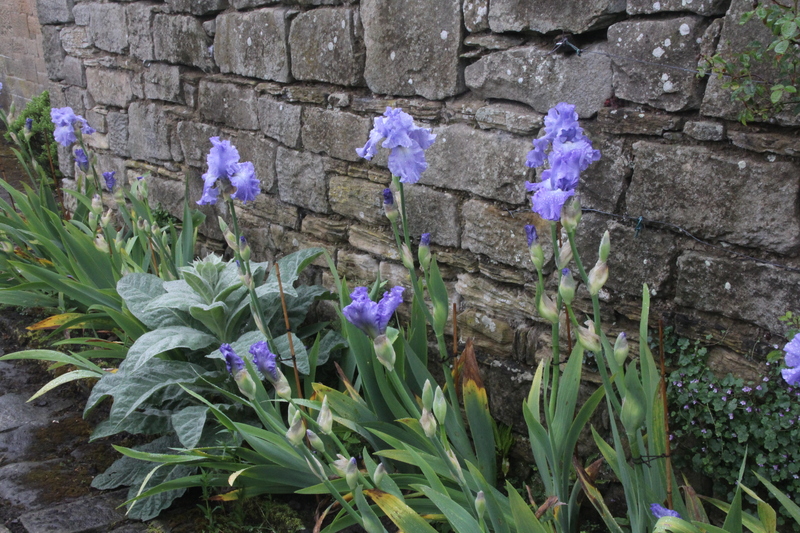 I planted out some Agapanthus I’d grown from seed along the back wall last year as I thought they’d enjoy a good cook against the south facing wall. And look – over a dozen flower heads. So exciting! The Swing Beds definitely need a sort out. Since their creation in 2011 it’s taken some time for them to fill up, but now, all of a sudden, I feel they’ve got rather unbalanced, with certain thugs taking over at the expenses of other things. I definitely have too much of the pink geranium along the front, so I need to thin that out. And then I also have a number of annuals I’ve grown from seed which need to be slotted in. The grass bed has been completely dug over and emptied (apart from the Stipa) and has also been planted with annuals. I’ve taken inspiration for the first year we were here, when I simply planted Cosmos in this bed. This year I’ve included Cosmos bipinnatus ‘Fizzy White’ but have added Ammi visnaga ‘Green Mist’ to the mix. I’m hoping for a white/green froth to echo the cow parsley in the field opposite. We’ll see. And in the interim, I’ve planted a few marigolds I had kicking around along the front edge. I have been quite busy planting up pots post the big bulb throw out, but the one below is a new one, one of a matching pair given as a gift from my sister. The concrete post is by the old (empty) chicken shed and the metal chicken normally sits on it but, as she’s not attached, she spends most of her time blown onto the ground. I think she looks rather more settled amongst the pelargoniums and ipomaea! In the Mid Century bed the Rosa ‘Falstaff’ is getting established on the obelisk, but you might remember I had good success with Rhodochiton atrosanguineus here last year, and I have now also planted some seedlings to see if they’ll cohabit with the rose. On the other side of the garden the Oak Bed has now developed into a wall of shrubbery – the Cercis in particular has really filled out this year. 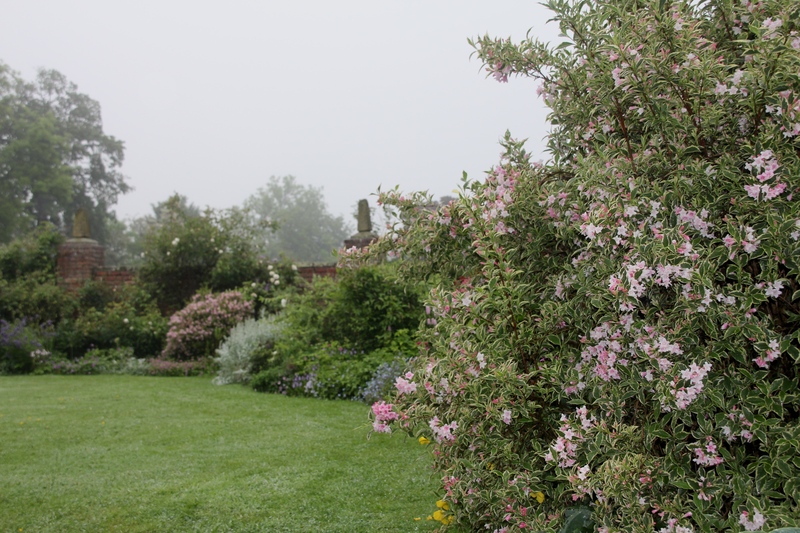 Closer to the house the Bronze Bed, new last year, is also exhibiting a rather floppy rose – Rosa ‘Pat Austin’. I’m sure she wasn’t this tall last year and I pruned her pretty hard. She may be a rather ungainly girl, but she’s certainly pretty. In the greenhouse I’ve finally planted out my tomatoes, cucumbers and aubergines, but I couldn’t bear to pull out the Sweet Peas as they’re still flowering really well, so the toms have been relegated to each end of the bed. ….compared to all this lot outside! Roll on the weekend…. 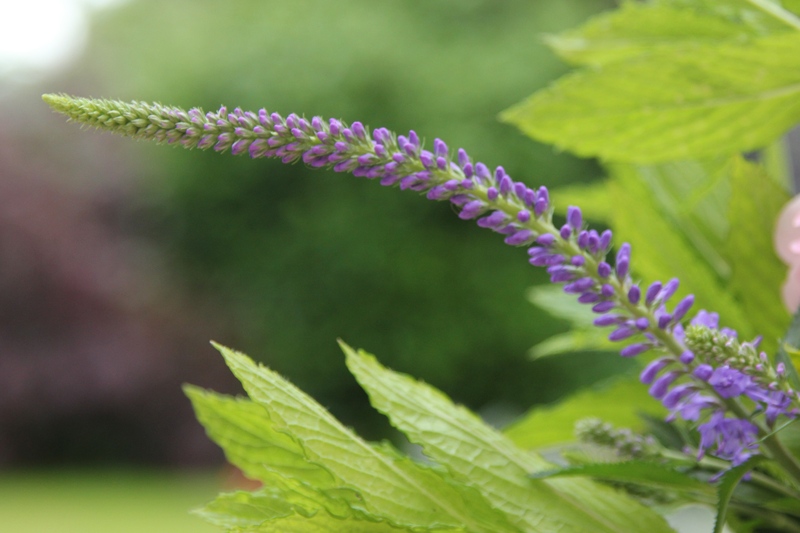 With many thanks to Helen at the Patient Gardener for hosting our End of Month views. This entry was posted in End of month view and tagged Broccoli 'Early Purple, Cavolo nero 'Black Magic', Cercis canadensis Forest Pansy, Chard 'Pink Flamingo', Courgette El greco, Courgette Gold Rush, Dahlia Fuschiana, Dahlia La Recoleta, Dianthus Sooty, Digitalis x mertonensis, Dwarf French Bean 'Safari', Mange tout 'Shiraz', Rhodochiton atrosanguineus, Rosa Falstaff, Rosa Jubilee Celebration, Rosa Pat Austin, Runner bean 'Lady Di', Salvia horminum 'Oxford Blue' on June 30, 2016 by jenhumm116. This entry was posted in Uncategorized, Wordless Wednesday and tagged Papaver somniferum 'Lauren's Grape' on June 29, 2016 by jenhumm116. In contrast to last’s week’s vase, this one was for a female host, and one I’d never met. She and her husband had invited the OH and me to join them at their golf club in Hampshire for their 125 year anniversary celebrations and were then putting us up overnight. 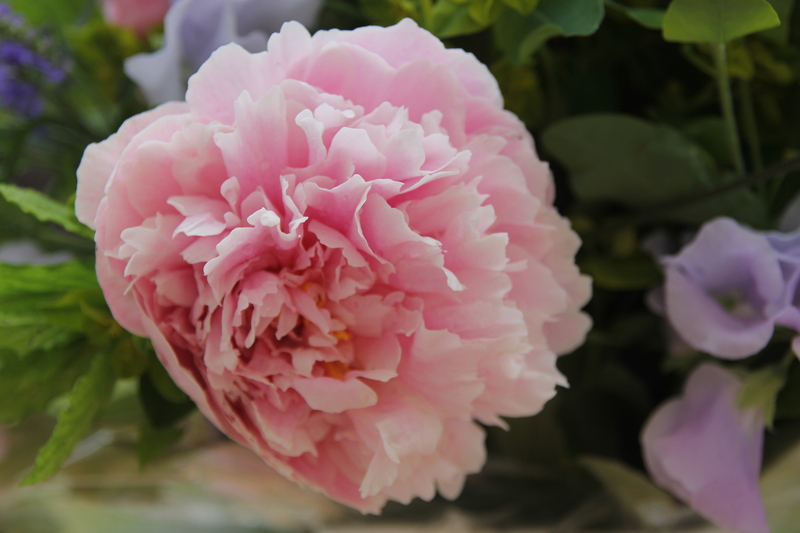 It seemed to me this called for the big guns, and here they are – gorgeous girly, blousy Sarah Bernhardt peonies. 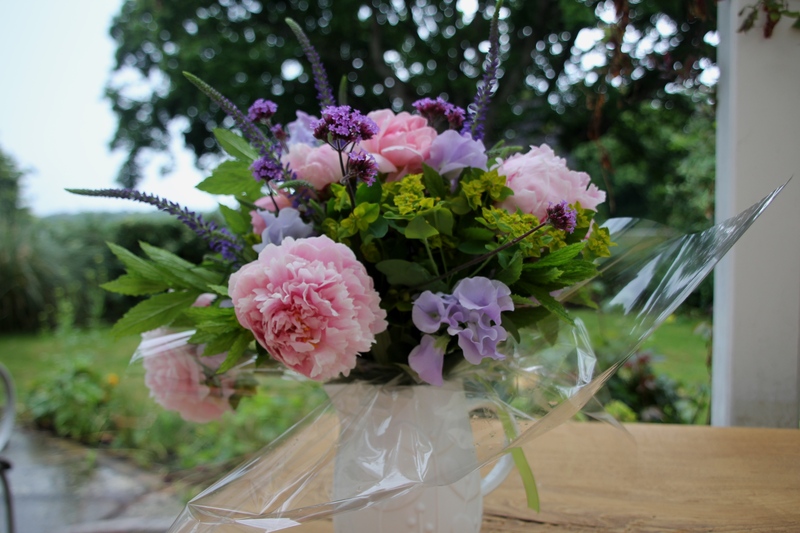 I’m delighted to say that the event, our hosts and the bouquet’s reception were fabulous! 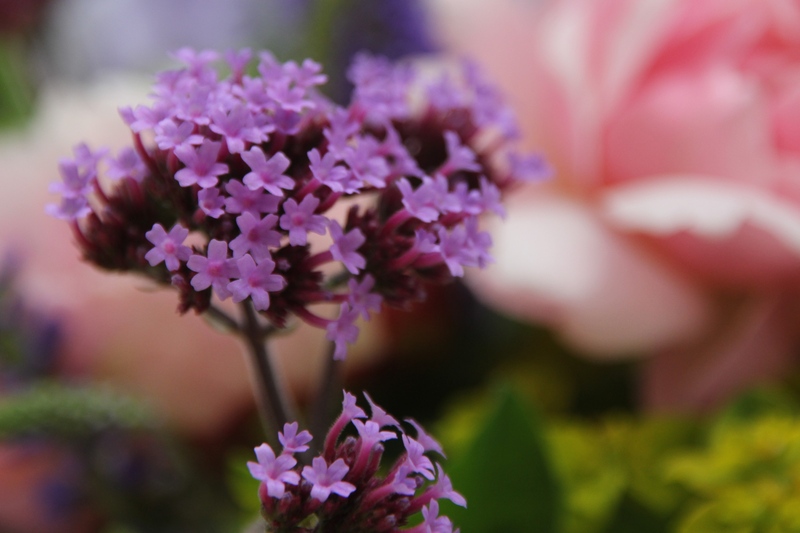 You really can’t go wrong with home grown flowers. With many thanks to Cathy at Rambling in the Garden who hosts this lovely meme. 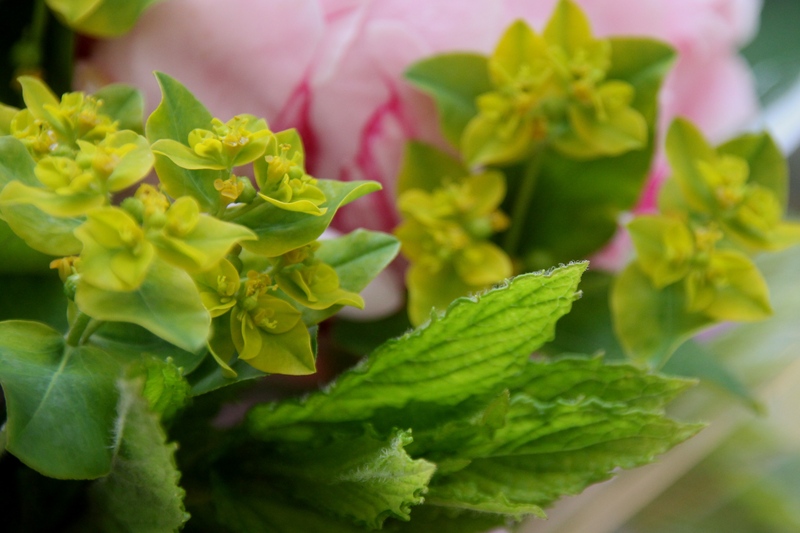 This entry was posted in In a vase on Monday and tagged Euphorbia polychroma, Mint, Peony Sarah Bernhardt, Verbena Bonariensis on June 27, 2016 by jenhumm116. Whalton Manor is a 17th century house with a beautiful three-acre garden which I discovered by complete chance, reading a gardens article in a Northumberland tourism magazine in our hotel room. The garden only opens by appointment so I immediately emailed to see if there was any chance of a visit. Amazingly, within 24 hours, Penny, the owner, had phoned from her holiday to confirm there would be someone in the house, and so, yes, I could come! Sadly the weather was still poor, but the garden certainly wasn’t. And to make it even more special, I was given a lovely tour by Sue, one of the (part time) gardeners,which made it even more special. The link with the previous Lindisfarne post is that Lutyens and Jekyll spent time at Whalton Manor during the time they were working at the castle. Lutyens designed the summerhouse, fondly known by the family as ‘Caesar’s Palace.’ It’s used now for weddings and there are some gorgeous photos of sunny garden nuptials on the website. 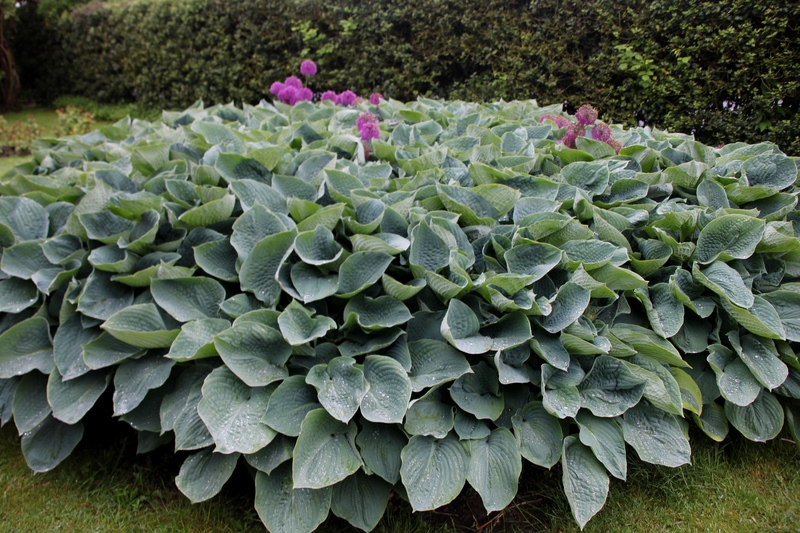 The majority of the garden is behind the manor, but both the wisteria (top) and this stunning hosta bed were in front. Behind the house were numerous sweeping beds with soft coloured planting, all contained and enhanced by beautiful walls and structures. Our route took us past this intriguing gate. Apparently many visitors discuss its ‘Lutyens credentials’, but it was in fact crafted from old lift panels under the instruction of the current owner’s father! Into the veg area there was a good sized greenhouse, but not a tomato to be seen. 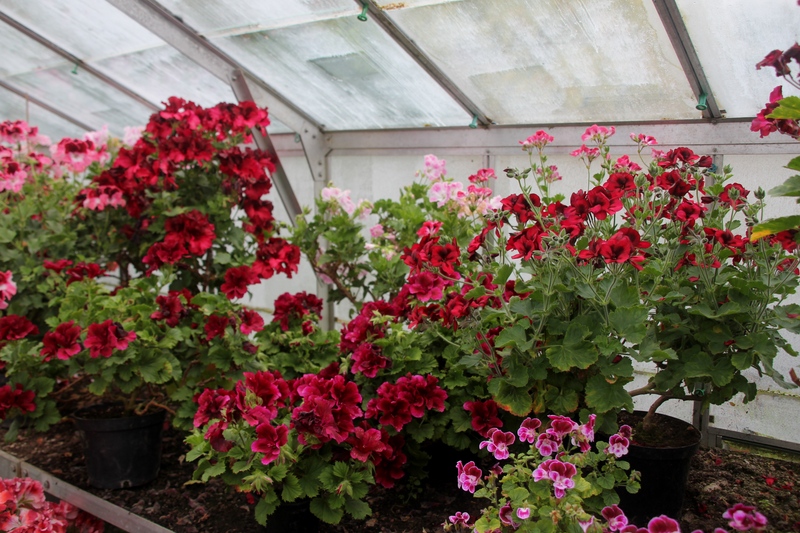 Instead, it was absolutely crammed with vibrant pelargoniums. 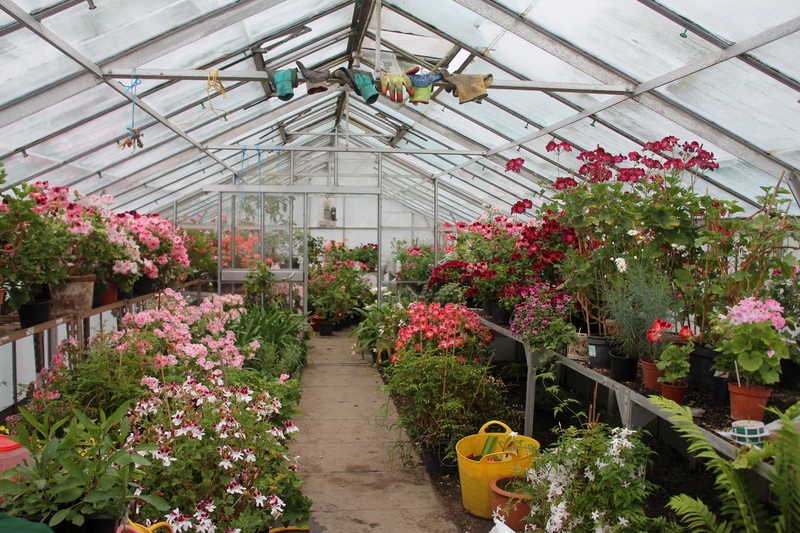 It came as quite a shock after all the misty, muted loveliness outside, but I thought it was fabulous and it has inspired me to keep some of my pelargoniums grouped in the greenhouse like this. 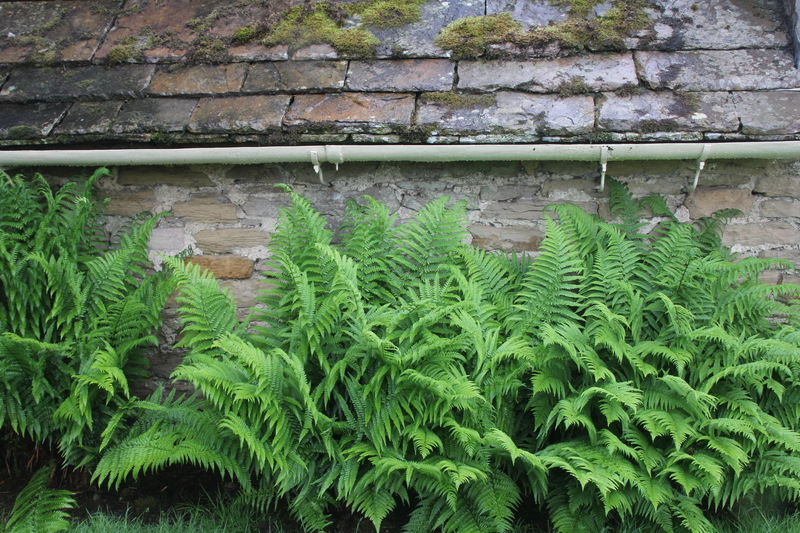 and these voluptuous ferns fronting gorgeous slates and stones. So thank you, both Penny and Sue, for a wonderful treat. I hope one day I’ll make it back in the sunshine. This entry was posted in Garden visits and tagged Edwin Lutyens, Getrude Jekyll, Whalton Manor on June 26, 2016 by jenhumm116. Lindisfarne Castle was our penultimate Northumberland destination. I was particularly inspired to visit having seen it from the train this time last year whilst uni visiting with my daughter. Sadly, whereas last year the weather was fine and the views astounding, this year June brought gloom, rain and chill. And we could barely see the sea (about 50 feet away) let alone the Farne Islands off the coast. The castle was discovered, empty and neglected, by Edward Hudson (founder of Country Life magazine) in 1901. 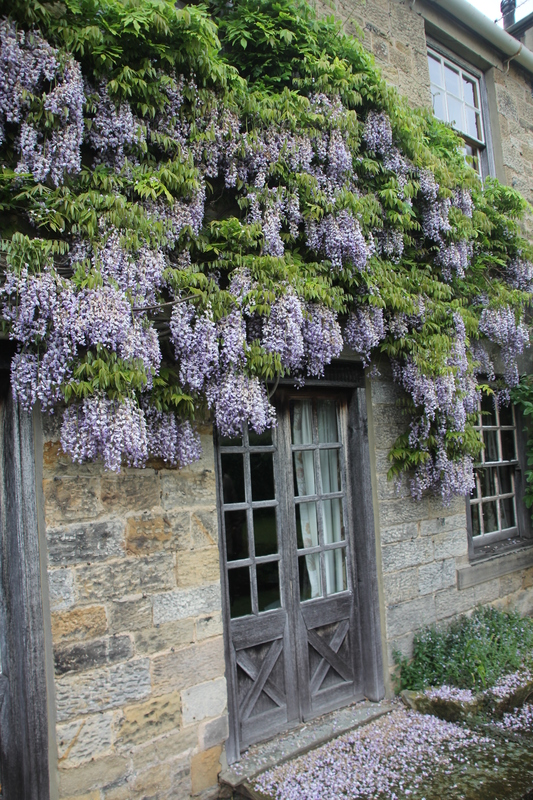 He fell in love with it and hired Edward Lutyens and garden designer Gertrude Jekyll to bring it back to life. After an fascinating tour around the castle itself, we left in search of the garden, which was in no way obvious. I assume it was placed back behind the the castle to protect it from storms off the sea, but I was surprised at how completely separate it was, until I read that it had originally been a vegetable garden created to provide food for soldiers living in the castle. 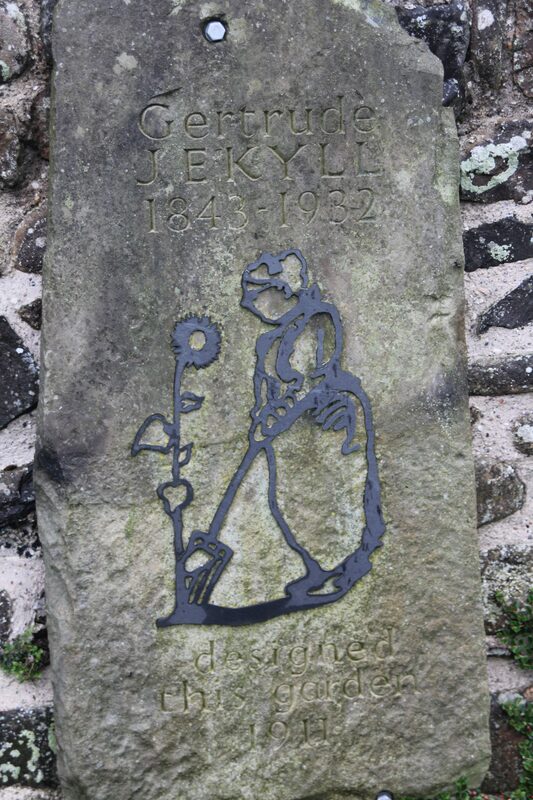 Jekyll’s contribution was to redesign the garden to include hardy annuals, colourful perennials and heritage vegetables to (according to the NT website) “provide a riot of colour in the summer and a leafy, sheltered oasis all year round”. In the plan above the silver edging is provided by Stachys, but this has now been replaced by Artemesia which certainly provided some light in the gloom. Interesting to see Delphiniums in bloom, which hadn’t been at Alnwick. Interesting too to see this way of training Broad Beans. Shame I didn’t remember when I was staking my supposedly self supporting ‘Sutton Dwarfs’ earlier today. I think this might have been a whole lot easier. And to finish, another photo from the board. Apparently this is how it can look. Huh! This entry was posted in Garden visits and tagged Gertrude Jekyll, Lindisfarne Castle, National Trust on June 26, 2016 by jenhumm116. Today’s vase was created to give as a gift to a male host so I thought I’d better steer clear of soft pinks and peaches, and decided to go with a deep plum theme, livened up by Euphorbia polychroma. I cut two plants for the first time – Lysmachia atropurpurea, to provide vertical accents, and the lovely, silky Papaver somniferum ‘Lauren’s Grape.’ I seared their stems in boiling water but to be honest I’m not sure how long they’ll last. I really must cut some for home to find out! and my lovely, new, neat, dark La Recoleta dahlias. It seemed to be well received, but the matching bottle of wine was probably his preference! With thanks to Cathy at Rambling in the Garden, who hosts this lovely meme. 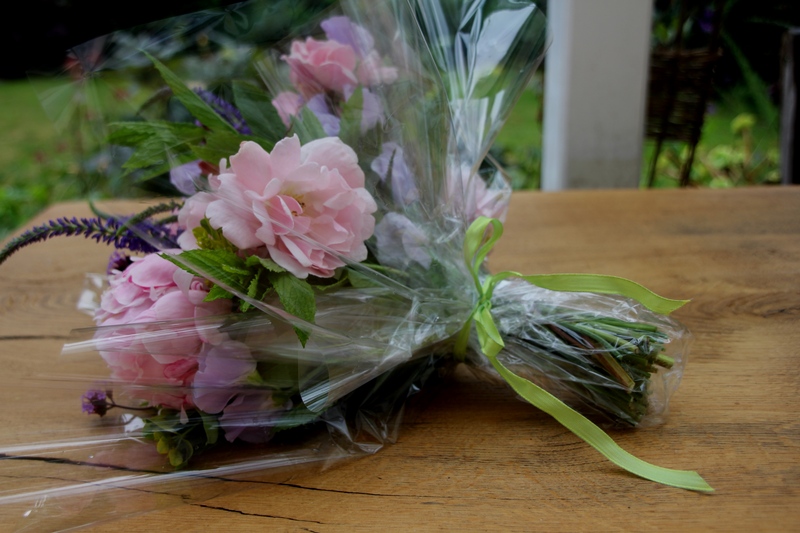 This entry was posted in In a vase on Monday and tagged Dahlia La Recoleta, Euphorbia polychroma, Lysmachia atropurpurea, Papaver somniferum 'Lauren's Grape', Rosa Munstead Wood on June 20, 2016 by jenhumm116. Cragside is a fascinating National Trust property near Rothbury in Northumberland. 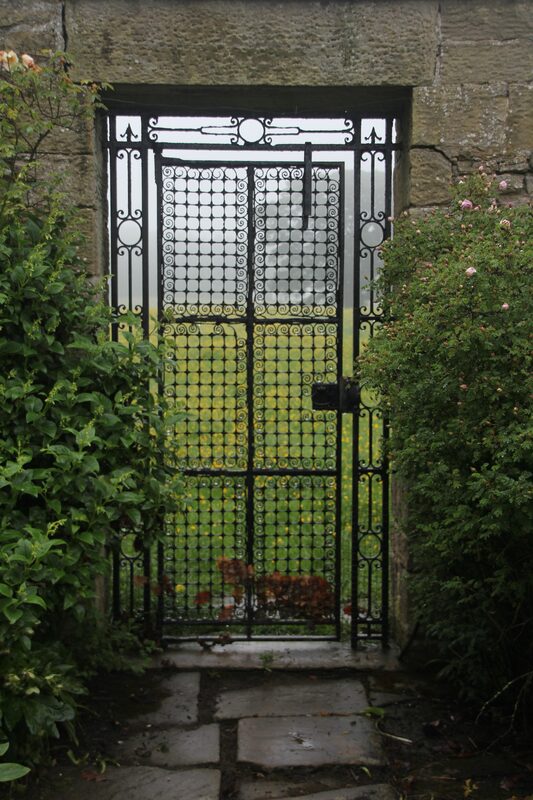 It was the home of Lord Armstrong a Victorian inventor, innovator and landscape genius. Trained as a lawyer, he only turned to engineering later and was completely visionary. The house was the first to be lit by hydroelectricity and is still crammed full of ingenious gadgets such as a water powered piston lift and all 350 light bulbs in the house are lit by a water powered Archimedes screw. 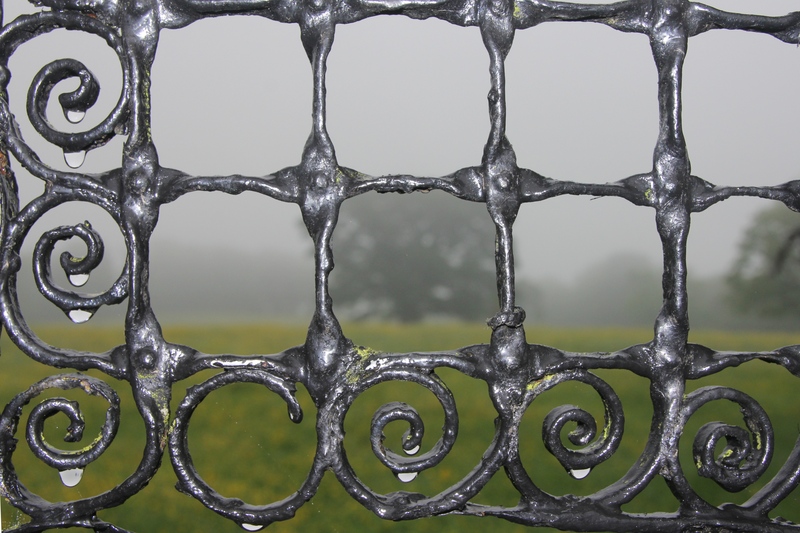 Having enjoyed a fascinating visit to the house, we emerged to some really grim weather. 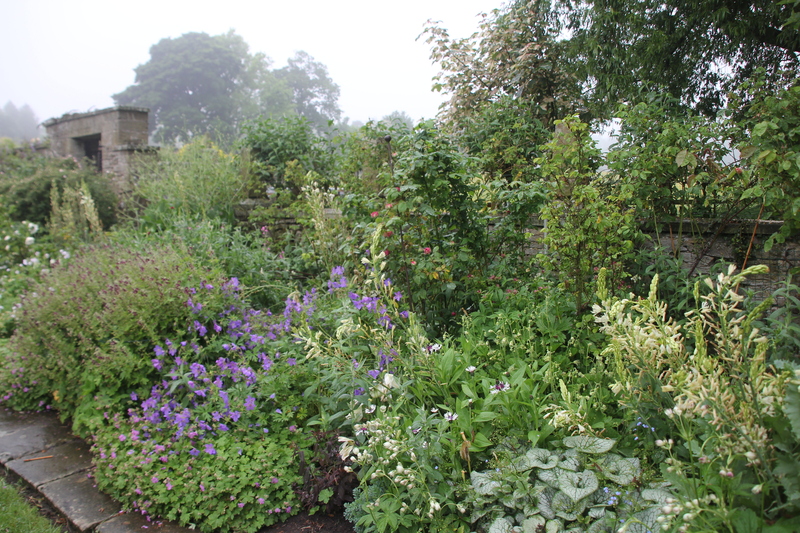 We’d already braved Alnwick in the morning and had got pretty damp then, so the idea of a soggy walk around the grounds really wan’t that appealing. And then I looked at the information leaflet and realised there was an alternative. The estate is so comprehensive they have established a one way, six mile long ‘estate carriage drive’ which meanders through the entire 1000 acre estate. Perfect. And it was. This entry was posted in Garden visits and tagged Cragside, National Trust, Rhododendron on June 19, 2016 by jenhumm116.